CPS is delighted to offer a superb range of high-quality staging platforms which have been specifically designed for an educational setting. 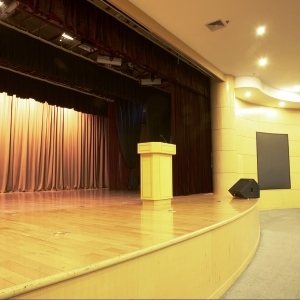 Whether your stage is large or small, simple or complex we can help you achieve the desired look and exclusive school staging packages and rates are available along with our unique and unrivalled lifetime warranty. From the very start of the new calendar year right through to the Christmas festivities, a school hall is a busy place and is used for a variety of activities and events. The efficiency, usability and flexibility of the floor space is therefore of paramount importance. Here at CPS we firmly believe that a professional stage system is essential in increasing the confidence of both students and staff alike and can help lift the level of performance from an audience and performers perspective. Our school stage decks have a very professional look and feel to them with securely fastened beech finished decks, which can be polished, tiled or carpeted. The wide range of colour finishes also allows the system to complement any colour scheme or style within a school hall. Many accessories are also available to complement the staging systems and include: steps, valance curtains, back drop curtains, fascias, handrails, choir holding borders, storage trolleys, lecterns, sound and light kits. We have the ability and products to fully customise your stage to meet your exact needs and specification. If you have any storage problems at your school then worry not. Our staging systems have been cleverly designed to store compactly and a complete stage of up to 40m² can be stored in just 2m² of floor space which helps maximise your storage capabilities. This storage benefit is also good from a health and safety point of view. These are the kind of qualities and solutions that have been consistently delivered to our customers and clients over the last 52 years which has resulted in us gaining a competitive edge over our competition. A free demonstration can be easily arranged where we will personally show you just how good our staging is. We can also offer expert advice on how to maximise the space in your school hall for 2018 and beyond. Please call Tim Gilson on 01302 741888 to arrange a free quote or demonstration or email us your requirements.